Hello! Happy Thursday. I am back today with another wonderful ebook from Vivebooks. 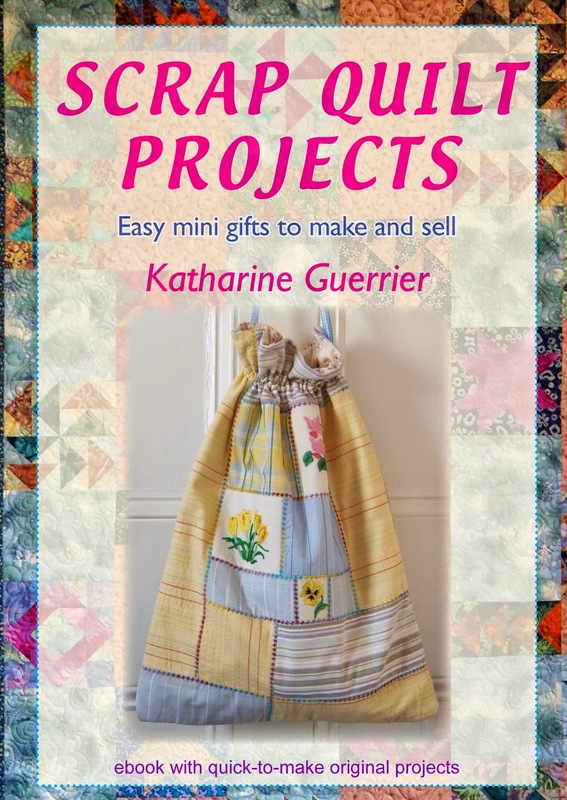 This one is called "Scrap Quilt Projects" and the subtitle is "Easy mini gifts to make and sell". I love this book for so many reasons. Let me tell you about it and then at the bottom of the post there will be a giveaway for you to enter to win a copy on CD. First of all this book is an ebook which offers many conveniences to readers such as an interactive table of contents where you can just click the name of the project you want to see and be taken there in the book immediately. There is also a supplier list where you can click the supplier and be taken to their website. You can also enable 'previous view' and 'next view' buttons on your toolbar and this will allow you to browse the book the way you browse a website.Those are the technical aspects that I like. This book is fantastic for all skill levels. 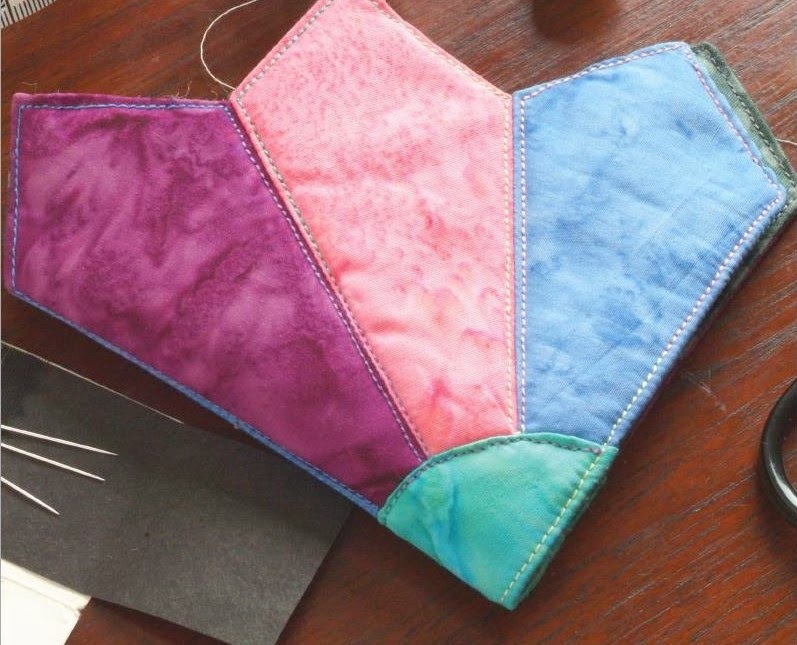 It teaches a variety of techniques for those just beginning in quilting and it has quick makes for those who have been at it for a while. There's nothing more satisfying than a finished project! Now as you know, if you follow my blog, I am crazy about swaps right now. Usually there is something specific you are supposed to sew for a swap such as a mug rug or a mini quilt. Then it is also nice to include a few extra surprises that your partner is not expecting. These could be pin cushions, needle books, zipper pouches and so on. I found this needle book called 'Petal Needlecase' in "Scrap Quilt Projects" that I think would be an amazing little swap extra. I love that it's not your usual rectangle and as you will see in the book it is actually not difficult to make at all. 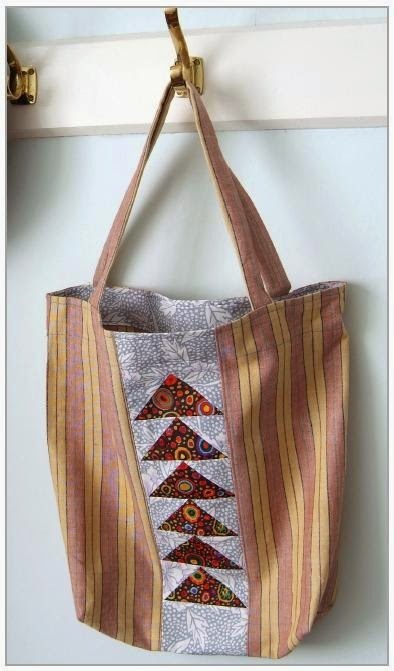 Another fun quick project in the book is this shopping bag. This is a great way to learn flying geese without trying to sew a whole quilt when you're first starting out (like I did) and getting overwhelmed (like I did). Again, customize this with fabrics you love and then wear it out shopping with pride. You can see in the book cover photo that there is also a Flying Geese Quilt and a beautiful Vintage Drawstring Bag made with re-purposed vintage embroideries. If you have found some of these treasures in your local thrift or antique shops and are wondering what to do with them this is a great idea. This way they're out of the closet and drawers where you can see and enjoy them plus they're now made into a useful item. There are 10 projects in "Scrap Quilt Projects" plus a techniques section and a suppliers section. Vivebooks has generously provided me with a CD version to giveaway to one of you! Thank you Vivebooks! They've also offered a discount code for 10% off the price of the book. You can order either a download or a CD. The code to enter is ‘daydreamssqp’ and it is valid until January 18th, 2015 (cannot be combined with any other offer.) Enter this code in the box on the basket page and then click 'apply coupon' to get the discount. Please use the Rafflecopter to enter the giveaway. This giveaway is open to everyone worldwide. If you do not have a Facebook account to log in with you can just use your name and email address. Disclosure: I was given a free copy of the book my review. All my opinions are my own and have not been influenced in any way. The links in this post are affiliate links.